Old man winter is finally here. It’s about 26 degrees here in Fredericksburg, VA. There is no better time to crochet especially when it’s freezing out, brrrrrrr! With that being said, let’s get moving on the Pocketed Hooded Cowl. 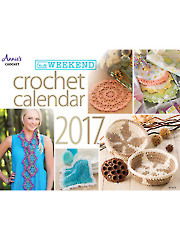 Since I’m always looking for something small to make in between projects I purchased In a Weekend – Crochet Calendar 2017. I like adding my own flare and I didn’t not use the yarn recommended. I used 2.5 skeins of Mega Brushed yarn from Premier Yarns. This is a fuzzy type of worsted weight yarn and it can be troublesome when frogging, so be careful. It is still soft to the touch and versatile. Worn up it’s a hooded cowl. I would wear it either inside or outside my coat. Roll that hooded cowl down and now your have a cowl. I’m thinking about adding a wooden button on the pocket bands. Now it’s a full cowl. As we draw near to 2017 I want to wish everyone a Merry Christmas and Happy New Year! CYA in 2017 and Happy Hooking! Check out my Projects in Motions page to see what I’m currently working on or what is next on the hook. This Way That A Way Hooded Cowl is a quick and easy project using a skein of variegated yarn. You can use any worsted weight yarn but variegated works the best for giving each hooded cowl and different design. This designed was created during the craze of pooling that was popping up on my Facebook feed. If you don’t know exactly what pooling is click here and you will find plenty of information and links that explains it from The Crochet Crowd. This was made to be worn either as a cowl or as a hooded cowl, the choice is up to you. It was snug enough to be worn comfortably around your neck. If snug is not your thing you can easily adjust your starting chains. This way it’s a cowl. Round 1: Ch 100, join with slip stitch to form a ring, be careful and not twist chain. Round 2: Ch 4 (counts as dc and ch1), dc in next st, *ch1, sk next st, dc in next st, repeat from * around, join in dc in 3rd ch of turning ch, turn. Round 3: Ch4, *dc in next dc, ch1, repeat from * around, join in dc in 3rd ch of turning ch, turn. Round 4 – 32: Repeat Round 3 until the desired length. I used the entire skein of yarn because I like a snug fit cowl around my neck and it was enough to cover my head like a hood. To make a shorter or longer hooded cowl increase or decrease rounds. To make a larger or smaller hooded cowl increase or decrease your starting chains. This way it’s a hooded cowl. Try this hooded cowl with the new Caron Cakes and Sweet Roll yarn and see what you can come up with. This one was made with Sweet Roll in Wild Cherry Swirl. I just love the names of these colors. Makes me so hungry. I got a little carried away with the graphics and wanted something different. My model was such a sport when I showed her surrounded by wolves. This picture got me a few more orders also. I made this hooded cowl with Homespun yarn by Lionbrand and I made 80 chains instead of 100 since it was bulky yarn and I still wanted a snug fit. As you can see you can use any type of yarn with a slight modification of your starting chains and a larger hook if necessary. Use the links below and share on social media.